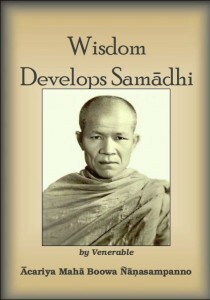 Wisdom Develops Samadhi is written by Acariya Maha Boowa Nanasampanno the abbot of the Wat Pa Ban Tad country monastery in Thailand. This book was first published in 1980 in Thai, then translated to this English version. Many Pali-words are left untranslated but the books has a suitable four-page glossary explaining words and concepts like Appana, Bhavana, Dukkha, Magga, Sacca etc.